River Court has two suites available for residents to rent. 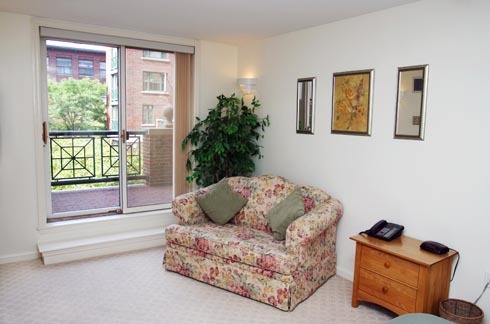 Residents may rent the Suites for their family, friends, and business associates visiting the area. The Suites are located on the second floor off the Central Tower elevator. Guest Suite #1 consists of a bedroom and sitting area. The Suite has been furnished with queen-bed, full bath, and sitting room with queen size sleeper sofa. Effective 1/06, the charge for Guest Suite #1 is $135 per night, including use of one Visitor Parking space. Guest Suite #2 consists of one room and is furnished with queen size bed and twin size love seat. The room also has a balcony that overlooks the back courtyard and fountain. The nightly charge for Guest Suite #2 is $110, including use of one Visitor Parking space. Sheets and towels are provided. Kitchen facilities are not available but there is a mini-refrigerator in each unit. Please contact the Concierge regarding availability and reservations.